I have really obviously not been in a scrapping or blogging mood this week. I have only made one project and it was a "have to" for a DT. And I haven't bothered to blog at all. I sorry to leave you guys hanging all week. Hopefully this week will be more productive and creative. I know it will be busy tomorrow on Halloween. The kids are all getting dressed up in their costumes for school and then the 3 little ones will have a parade and parties in their classrooms. 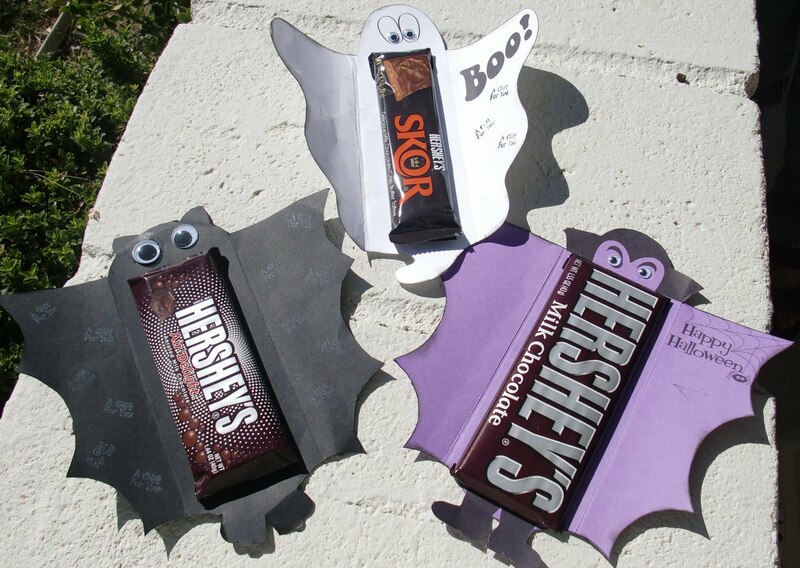 Then they will come home, do homework (if there is any), eat dinner and then go trick or treating. They are super excited!! I am trying to get them to all settle down and go to sleep but it isn't working very well. We carved pumpkins tonight and they turned out pretty cute. We had a couple of mishaps but we fixed them. What do you think?? I haven't shown you anything I got while I was on my trip yet. I found some fun things to use scrapping like a basket of laces and ribbon for $3 and 3 jars of spools and a jar of sewing notions. I collect depression glassware in Ruby Red and Emerald Green and I found some new pieces to add to my collection. I'm always on the lookout for anything new (to me). I found this gorgeous red "Oyster and Pearls" platter and a large green brandy snifter. It is really large (not for drinking out of). I have about 5 of these type vase things in red (in various patterns and sizes) and I have them displayed at Christmas with colored lights in them and it is really beautiful. I plan to add this one to that group. I also got a "to die for" emerald green cake plate but I haven't taken a photo of it yet. I will share when I do. This isn't all of my goodies but it should give you a little taste of my treasures. I plan to take Halloween photos tomorrow and share them with you all so come back and visit. 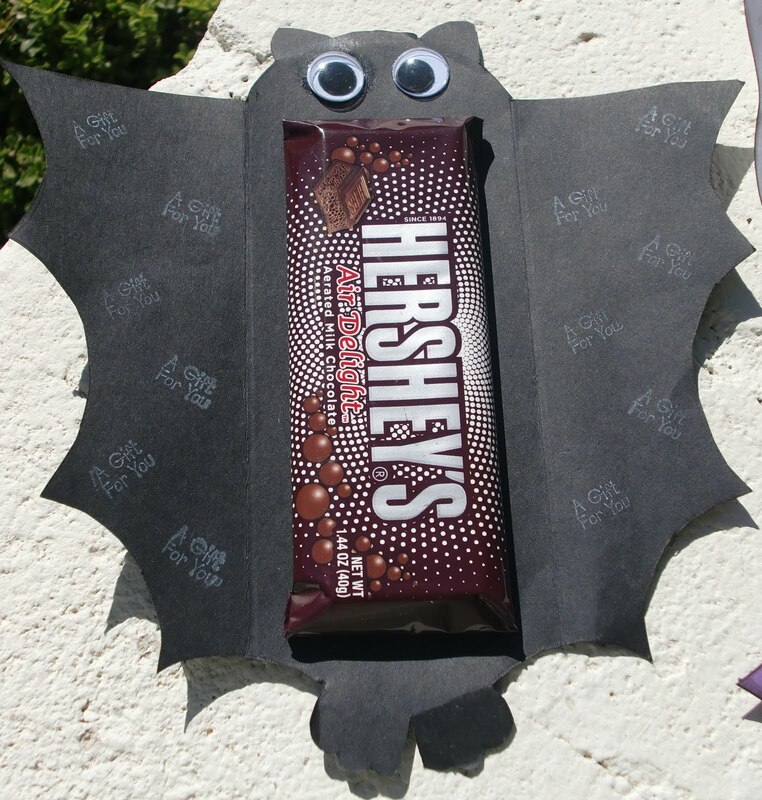 I found this cute project in Woman's Day Halloween Celebrations Magazine. 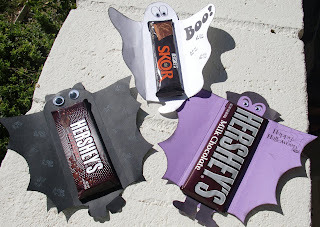 The kids and I thought it would be fun to make for their classmates for Halloween. So we have been working on these little cuties all weekend. I am only showing you one of each but we have made a TON of them!! LOL You all know that I have 5 kids and all of these kids are in school and have classmates. So we had to make quite a few for them to give away. I just printed out the pattern on colored paper and then we fussy cut out the image. Next we inked the edges, stamped some sentiments and then glued on google eyes. I creased the folds on my Crafter's Companion Ultimate Tool but you don't have to have one to make these adorable little treats. 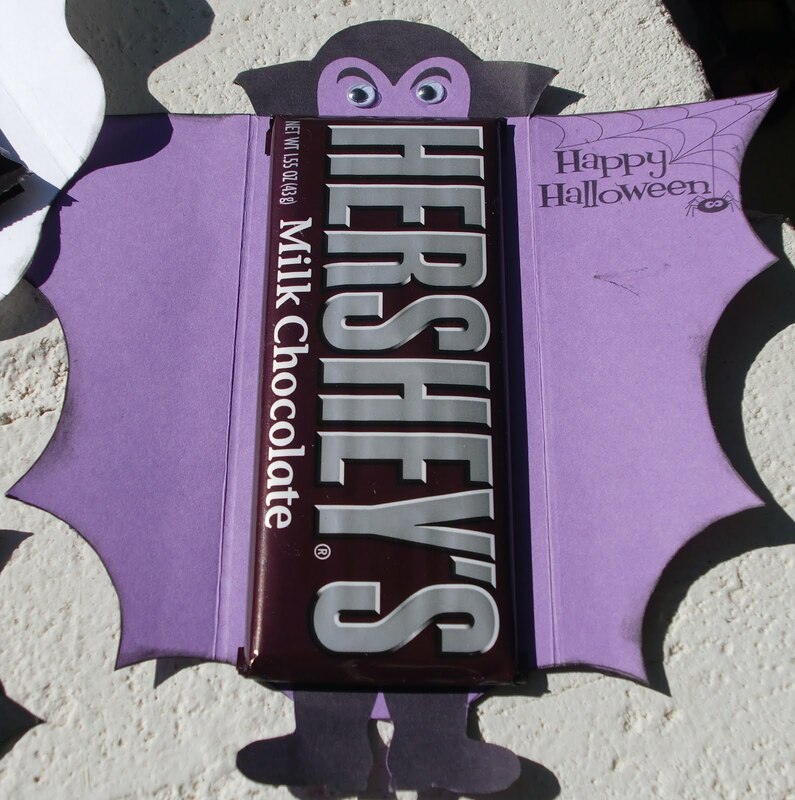 I used double sided tape to adhere the candy bars. The pattern works perfectly with Hershey Chocolate bars. They are just the right size but I wanted to show that you could use other types of candy too. I think these will be a big hit with the kids in my children's classes. I need to do a couple of DT projects in the next day or so. I should have been working on them this weekend. The kids have a short week at school this week, only 3 days. And then it is already the end of October and Halloween!! Where did the month go??!! Are you like me and feel like October just zipped by?? I hope you have had a great weekend. Thanks for stopping by. I'm excited to share my newest project with you. I recently received the newest collection of Humphrey the Elephant Stamps from Crafter's Companion. And I really LOVE THEM!! I was especially drawn to this stamp set - Especially for You. Isn't she just adorable?! I decided to paper piece her dress out of some Graphic 45 Christmas paper that I think is yummy. I stamped her out on white paper and colored her with my Copic Markers. Next I stamped her on my patterned paper and cut out just the dress part of the image. Next I layered the patterned paper piece on top of the colored image. Next I made an exploding box using my Ultimate Tool. This is just super easy to do. I used measurements that I received from a follow Design Team member, Jinky. She has calculated the exact size to fit a cupcake inside!! You can find these measurements on her blog. For my exploding box I made the base piece and then I made a lid to top it off and inside is an upside down lid that you glue down to keep your cupcake in place. Can't you just see these as the perfect gift for a teacher or friend. Or as a take away gift at a party or wedding?? I am giving this set to our Mail Carrier. I have a super easy recipe for a Wonderful Pumpkin cupcake/muffin that I want to share with you. 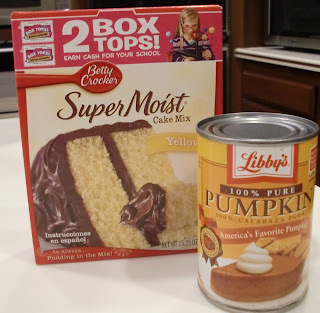 One box of yellow cake mix and 1 small can of pumpkin. Just mix the two items together. Next fill muffin tins about 3/4 full. (I use cupcake liners). Bake at 350 degrees for approximately 20 minutes. Cool. That's it. They are ready for you to enjoy. You can ice them if you want or just eat them as is. You can use other flavors of cake mix. I have used spice cake and chocolate cake and they were both yummy. You can also add nuts and/or cinnamon to the mix before baking. I have even topped them with mini marshmallows. You are only limited by your imagination. I hope you have enjoyed my project and I really hope you have a chance to make these sweet treats. Thanks for stopping by here today. Until next time....happy scrapping. Last Sunday, while Denise was here visiting me, we decided to take a class at my local scrapbook store. The class was to make a tray using the new Graphic 45 - Christmas Emporium Collection. The actual project used vintage photos of people I don't know. I wanted it to be a bit more personal so I decided to print out some photos of my children and use their photos on the tray. I did end up putting one of the vintage photos on it too. I think Denise was going to add personal photos to her tray too when she went home. The instructor provided everything else we needed. She purchased the trays from Michael's for $10 each. She was pretty stoked to find them at such an inexpensive cost. They are really nice trays and come in black or white. We really had a good time at the class. I'm glad I thought to check and see what classes were being offered while Denise was here visiting me. Okay, enough for today. Thanks for stopping by my blog! Scrap Our Stash has a fun "Quote" Challenge going on this month. You are required to use a quote on your project. I made this layout of my son who loves to ride his bicycle. I'm surprised I don't use quotes on more layouts because when I do use them I LOVE them. I took these photos of my ds when he was out riding his bike with his brothers and sisters the other day. He LOVES to ride his bike as I have already mentioned! And loves to get his picture taken. He asked me to take these! ha And I thought they were cute photos so I decided I would try to record this moment in time with a layout. But wait this is a quote challenge...so I needed a quote. hello....Google is your friend! LOL I just put in the search for bike riding quotes and up popped the PERFECT quote for my layout! It is a quote from John F. Kennedy that says, "Nothing compares to the simple pleasure of a bike ride." See....perfect! I really like how it turned out and I think it really does capture a moment in time. Now it is your turn to do the October Quote Challenge at Scrap Our Stash. Don't forget that there is a fun "Fall" challenge going on over at Sketches4all this week. There are a couple of great prizes so you might want to check it out!! Okay, back to having fun on my trip!! lol Hope you are missing me and leaving lots of comments. I'm away on my trip but I thought I would share this project and the tutorial I made for Crafter's Companion. It is getting to be "that time of year" when everyone is going to holiday parties and what should a nice guest do?? You should take a hostess gift! I like to take a bottle of wine to give to the hostess and these bottle tags are the perfect thing to dress up a bottle of wine. They are SUPER EASY to make. 1. 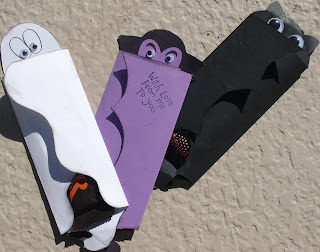 I start by cutting out a piece of card stock or pattern paper 3" x 8". You can use whatever size works best for the bottle you are working on but for purposes of this tutorial we will use 3" x 8" as our measurement. Using a corner rounder, round each corner. 2. Score a line about 2 inches down one end and fold over. While it is folded over round the corners. You will be cutting through both pieces of paper. 3. Punch a hole in the folded side. I used a 1 1/2" circle punch. That's it. Now you just have to decorate it. I decided to make this after getting my new S.W.A.L.K. stamp set -You Deserve a Treat. And let me tell you, I am seeing a million uses for this stamp set! It was a perfect accompaniment to this project. I plan to give it to my girlfriend to show her how much I appreciate all that she does for me. But you could make up a few of these hanging bottle tags to have on hand for the next time you need to take a gift with you. I hope you enjoyed the tutorial. And I hope you get a chance to make a few of these bottle tags. I also wanted to remind you that there is a fun "Fall" challenge going on over at Sketches4all this week. There are a couple of great prizes so you might want to check it out!! There is a Fall Mini Contest going on at Sketches4all from October 10th until October 17th. There are two challenges. One is to make a Fall themed Layout and the other challenge is to make a Fall Themed Card. Easy and fun right?? We are very lucky to have The Cutting Cafe as our sponsor for this contest. I'm sure you already know about The Cutting Cafe and all the fabulous affordable printable stamps and cutting files they have to offer over there. If you haven't already visited the site you need to go check out the awesomeness!! Regina over at The Cutting Cafe will be picking the winner of the Fall Card Contest and offering from The Cutting Cafe your choice of 3 digi sets to the winner!! The Sketches4all Design Team will be voting on the winner of the Fall Layout Contest and the winner will receive an awesome Embellishment Kit full of wonderful goodies. Our design team has been hard "at work" playing with some of The Cutting Cafe's gorgeous digis and here are the two projects I made to share with everyone. My first project is actually a peanut container that I repurposed and I am now using it for Teacher Treats. I used some fall themed items like the pumpkins and mini frame and the title. I printed them out, colored them with my Copic markers and the fussy cut them out. I know that my son's teacher will be happy to get this fun container. My second project is a card I made using Mini Colored Bingo Cards. Are they just so super cute?!?!? I can think of a million ways to use these little bingo cards. I focused on Pumpkins because I had this awesome Pumpkin paper from K & Co. that I just had to use. I used a large colored from from The Cutting Cafe that I layered with my pumpkin paper. Next I layered some paper with with a mini colored frame and then the mini colored pumpkin bingo card. I printed out the pumpkin image and the sentiment and colored them with my Copics. A little copper Stickles and I was done. 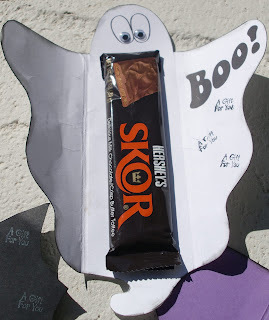 Now it is time for you to head on over to Sketches4all and join in the fun October Contest!! You might end up being the winner of one of the two cool prizes!! I've been having a blast hanging with my bestie! She flew in last night and we got busy scrapping almost immediately!! I ended up making two cards for Design Team projects so expect to be seeing them in the future. Today we got up early and took all the kids to Chuck E Cheese's so that they could play the arcade games and have fun being crazy. My littlest daughter is turning 4 this week and we went to celebrate her birthday. We came home afterwards and had her birthday party. She was so happy to eat cake and open presents! She is worn out now and taking a little nap. All the other kids are watching Transformers and Denise and I are scrapping again. I just made this cool card for the sketch challenge at Mojo Monday. I used my old Graphic 45 Christmas Past papers. I just got this ribbon in the mail as a winning RAK from a contest I entered. I inked it up a bit to tone down the bright green color. I wanted the card to look old. The other two Christmas cards I made using a free digi I got off of a blog and for the life of me I can't remember which one! I'm sorry to whoever I got it from for not giving you credit. I just printed out the sheet and then got out some small Christmas stamps. I inked and embossed them and then set them aside until I picked them back up to use on these cards. Anyway, I used some paper from My Minds Eye - Dear Santa collection and some ribbon from my stash. Easy peasy. I like the clean and simple lines. Okay, it is time for me to go back to scrapping!! I hope you are having a wonderful Saturday! First, I need to share the chicken that Georgie made. She wanted me to take some photos and put them on my blog...so here you go.... She looks a bit suspicious in the first photo. What do you think she is thinking??? One of the cards was for a mixed media challenge. I used a mask and two colors of Glimmer Mist. I love playing with Glimmer Mist! So much messy fun!! I cut out the birds out of Pink Paislee paper and popped them up off the paper. I used a little birdie stamp from Pink Paislee too. It was fun to play around with these things. I'm not thrilled with my card but I had fun making it. One challenge was to use an unusual shape for your card. I am really loving this flower shape so I immediately thought of making a card out of it. It is just a sweet and simple card. The last challenge was a fall color challenge and there were about 6 colors we were supposed to use. Luckily all of the colors were in this polka dot paper. I used clear bling and then colored them with a Copic Marker in the color that matched perfectly. Love doing this!! All of these were made for the 7 challenges at Pink Paislee. So there they all are. Well I did make 2 Christmas cards on WCMD too for Sketches4all that I will share with you another day. I'm getting excited!! My bff, Denise, is coming this weekend with her son and I can't wait! We are going to celebrate my dd's birthday and her son's bday while they are here. My kids are so excited they can hardly stand it! lol Denise and her son leave to go home on Monday and I leave for my trip on Tuesday morning at 6am! I will take a ton of photos and share some with you all. Let the fun begin!! !